I've got a small problem; on the attached jpeg you will see a housing (shown in black) and a pipe inserted from underneath. 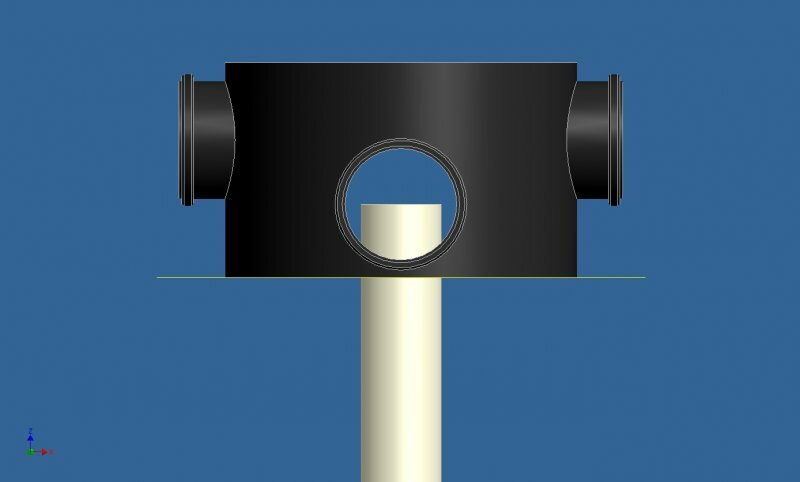 how can i trim the material (of the inserted pipe) so that its flush with the hole in the bottom of the housing i.e. so nono is visible when looking through the housing)? I'm not familiar with trimming in jpegs - zip and attach you assembly here. i've tried to attach the zip file, but its too large. Roll up the part EOPs first. I know its an old post , but does anyone found a way to solve this ? 2 move the end centre of pipe to the centre of the flange if length is not critical. Is this in Assembly files or just in Part files? If Assembly files , you can use constrain- joint(Inventor2016 version) /gap( before using this measure the extra length (command is distance) you need to move in order to flush at the bottom of hole) examples = -.25" or 1/4" or + 0.25" just play around to see it flush to the bottom. If a part files-- use sketch to plane parallel to the hole housing/ then extrude cut in order to remove the pipe excess you are seeing.